As this was written, Onomatopoeia (who appeared in 2002) was a blank slate super-tough killer of heroes with a gimmick. He has, of course, no face, a gun and a trenchcoat as per the stock boy’s fantasy. IIRC, this character has only been used by Kevin Smith. Perhaps subsequent appearances made him more of a character since. Height: About 6’ Weight: About 190 lbs. Onomatopoeia is a phenomenal, deadly combat machine. He can successfully shoot such agile and fast fighters as Green Arrow (Oliver Queen), Black Canary or Green Arrow (Connor Hawke), all of whom are known to routinely evade gunfire from proficient gunmen. He rarely missed even such opponents, unless they were all-out dodging – and he achieves solid hits. Onomatopoeia can often gain initiative even against extremely fast and experienced adventurers. This forces his opponents them to stick to reactive strategies instead of offensive ones. He’s very fast and agile, has a Rorschach-like resilience and tenacity, and possesses boundless ferocity and killing instinct. On several occasions Onomatopoeia has survived obviously fatal wounds after a short period of unconsciousness. It is likely he has superhuman recuperative powers. 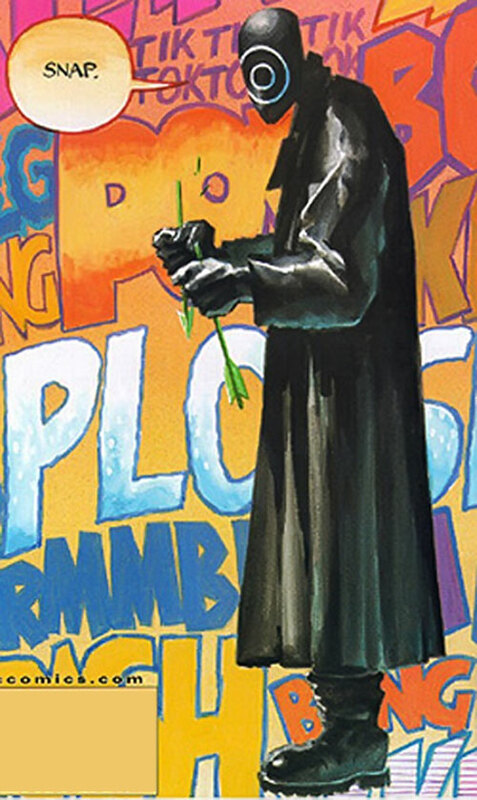 Onomatopoeia is a mysterious killer of heroes. He assassinated the local hero Buckeye in Harrisburg, Pennsylvania after bleeding his wife to death. Onomatopoeia then murdered the up-and-coming new hero Virago in Philadelphia. 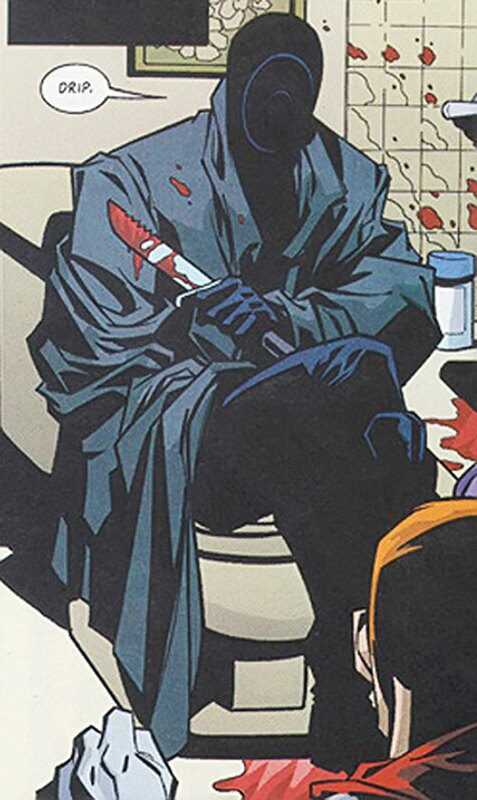 He then moved to Star City to kill Green Arrow (Connor Hawke), and inflicted a very nearly fatal head wound. Hawke had to be hospitalised in a critical state and was saved by a transfusion from his father, Green Arrow (Oliver Queen). Learning this, Onomatopoeia infiltrated the hospital to finish his. Killing most of the doctors, he seriously wounded Black Canary and Green Arrow (Oliver Queen) before they took him down. When Connor Hawke was announced saved, Onomatopoeia used the distraction to escape the heroes. Onomatopoeia only speaks by imitating noises – although he seems able to tell his own name. He will repeat most noises around him, and imitate the noises he’s about to make. For instance he’ll say “Schlack. Click. Bang.” before loading a new mag, cocking his gun and firing it. He can, and will replicate human noises if they aren’t actual words, such “unnngh” “groan” or “argh”. He seems compelled to repeat surrounding noises or preview the noises he’s about to make, which may seriously compromise his stealth. Onomatopoeia is incredibly brutal and fast. When attacking Connor he busted through the door and shot three quarters of the persons present in the head, one bullet each, in about six seconds. When Black Canary crashed through a large window to take him down, he calmly shot her, winging her in the shoulder, without stopping – and it is obvious he was aiming for the forehead. He kept moving like a professional martial artist and cinematic gunfighter. This remained true even when he was covered with blood and with three arrows badly stuck in him. He left no chance to Buckeye, Virago or Connor Hawke, using ambushes and sniper techniques. Only Connor’s peak human reflexes saved him from the first bullet, although even he couldn’t recover in time for the second. Onomatopoeia apparently decided his next kill would be Green Arrow after hearing about him on a TV show as he killed his previous victim. He thus seems insane. He also seems to have a strong sadistic streak, given the way he hanged and bled Buckeye’s wife in her own home. Onomatopoeia’s motivations and origins are a complete unknown. SPR (apparently, can only speak using onomatopoeia), CIA (imitating surrounding noises through onomatopoeia). Handgun with high-powered ammunition [BODY 04, Projectile weapon: 05, Ammo: 13, R#02] with two spare mags. Knife [BODY 08 EV 03 (05 w/STR, 07 w/Martial artist)]. He’s also known to use a tranq rifle [BODY 04, Range: 05, R#03]. The ammunition varies, but a typical set of stun doses would be [BODY 01, Flash: 07, Ammo: 04, Limitation: Flash is resisted by Systemic Antidote instead of Shade, Misc. : ammo for Tranq rifle]. Helper(s): John Colagioia, Peter Piispanen. 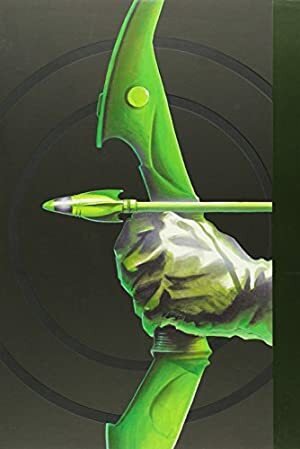 Source of Character: Green Arrow vol. 4.